Alfotawi, R.A., et al. The Use of Biomaterials and Tissue Plasticity for Regeneration of Bone Defect. (2019) J Dent Oral Care 5(1): 1-5. © 2019 Alfotawi, R.A. This is an Open access article distributed under the terms of Creative Commons Attribution 4.0 International License. The challenge of treating continuity osseous defects presents a formidable problem for orthopedic and maxillofacial surgeons. This due to inadequate vascularization at the defect site. To address this short- fall, the use of vascular connective tissue that can act as a bio-reactor for the growth of mesenchymal stromal cells, which can then provide a composite bone mineral for maxillofacial reconstruction has been reported. The role of muscle in bone regeneration has not been studied extensively, however there is proof that muscle has the propensity to induce bone formation because of its intrinsic osteogenic potential when exposed to osteogenic stimuli including bioactive ceramic and bone morphogenic proteins BMP. Method and Material: A critical size defect (8 mm in diameter) was created in the calvarium of 40 rats. Treated autologous muscle grafts were then implanted into the cranial defect. The cases were randomly divided into the following groups: (1) muscle injected with injectable Calcium sul phate/hydroxyapatite cement (CS/HAC) BMP-7/MSCs (2) muscle injected with CS/HAC/BMP-7, (3) muscle injected with CS/HAC, (4) non-treated muscle. At 8 weeks, the bone regeneration was assessed using histology. Result and Discussion: Clinically, cortical bone regeneration was observed bridge the defects area only in groups (1) and (2). Quantitative histomorphometry assessment showed that a high median bone percentage surface area was reported for group (1) at 64.2±6.0% (36.9–75.3). This study confirms the in vivo osteogenic properties of modified muscle graft when induced with bioactive ceramic, MSCs, and BMPs, these suggests novel strategies for bone regeneration. The challenge of treating large osseous defects presents a formidable problem for orthopedic and maxillofacial surgeons. The present method of choice to replace lost tissue is autologous bone grafting, but supplies of autologous bone are limited and harvesting of the graft is associated with donor site morbiditie. Artificial biomaterials offer much promise, but do not, by themselves, supply the osteoprogenitor cells needed for bone formation. More- over, there are often issues with resorption of the scaffold used in the biomaterial, coupled with inadequate vascularization. To address this shortfall, the use of a muscle flap that can act as a bioreactor for the growth of mes- enchymal stromal cells, which can then provide a composite bone mineral for maxillofacial reconstruction, has been reported. The role of muscle in bone regeneration has not been studied extensively, however there is proof that muscle has the propensity to induce bone formation because of its intrinsic osteogenic potential when exposed to osteogenic stimuli including bone matrix substitutes and bone morphogenic proteins[3-5]. The most accepted mechanism behind bone formation is that an inflammatory response at the surgical site, and the presence of osteogenic stimuli amplify the signaling of exogenous BMP-7, triggers the MAPK pathway, as explained by Hassel et al . To our knowledge there was only been one report on complete bone regeneration in long bones using an induced muscle graft which was injected with an adenovirus vector encoding BMP-2. An Induced pedicle muscle flap was used to reconstruct critical sized defect in the mandible was also reported[2,4]. Similar surgical techniques, using skeletal muscle flaps injected with a BMP-2 adenovirus have been used to reconstruct large cranial bone defects which reported variable results. This latter study reported that insufficient vascularization, and differences in the mechanism of bone formation between partial bones and long bones, could be reasons behind the suboptimal results that were obtained. Our previous work has, how- ever, demonstrated the remarkable potential of the use of muscle flaps, along with an injectable bio-cement loaded with BMP and seeded with rBMSCs, to induce bone formation for the reconstruction of bony defects. However, this latter study was conducted as a single cohort study group. This study aims at testing the feasibility of converting an induced muscle graft into bone in order to reconstruct asurgically created critical size defect in the calvaria using rats as the animal model. Our main objective was to assess the combined effect of osteoconduction, osteoinduction and osteogenesis (BMSCs) in reconstruction of the critical size defect using a muscle graft. The study included a comprehensive assessment of bone regeneration carried out using histological analysis. This study was conducted with approval from the Ethical committee, Dental Collage Research Centre, Dental faculty, King Saud University, Saudi Arabia. Sprague Dawley male rat’s bone marrow aspirates were harvested from the inbred transgenic strain (College of Food and Agriculture Sciences King Saud University). The rat’s bone marrow mesenchymal stromal cells (rBMSC) isolation and culture was carried out using a previously described protocol. The characterization and assessment of rBMSCs intended was carried out as previously reported. The cement used in this study was injectable bone cement (BC) (CERAMENTTM|SPINE SUPPORT, Bone Support AB, Sweden) which consisted of 60% calcium sulfate, 40% hydroxyapatite powder, and a liquid phase composed of water and iohexol. Forty male inbred Sprague Dawley transgenic rats (250–450 g) were obtained from the College of Food and Agriculture Sciences and kept in a dedicated animal research facility under veterinary supervision. An intraperitoneal injection using ketamine (50 mg/kg), xylazine (6 mg/kg), and acepromazine (1 mg/kg) was used to anesthetize animals before surgery. Before creating the craniotomy defect, the right hind leg shaved and disinfected. A 15 mm skin incision was then made to expose the hind limb muscle. An 8-cm2 muscle sheet was harvested from the biceps femoris and the harvest site was then sutured with 3–0 Vicryl sutures. The overlying skin was closed using Auto-clip Wound clips. The harvested muscle sheets were treated differently before implantation into the cranium bone defect. (1) BC/BMP/BMSCs, (2) BC/BMP-7, (3) and BC alone, this period, the critical- sized cranial defect was created. A 15 mm midline sagittal incision was created over the cranium and the periosteum was carefully elevated. A circular, full-thickness bone defect was created using in the center of the parietal bone using an 8-mm trephine bur with low-speed rotation (Torque Plus-AEU-12C, Aseptico, US) under constant irrigation with sterile saline to prevent overheating of the bone margins. Care was taken not to injure the underlying dura mater. The defects were then filled with the engineered muscle grafts (Figure 1). The animals were assigned to four different experimental groups, based on the treatment received being (1) BC/BMP/BMSCs, (2) BC/BMP-7, (3) BC alone, and (4) untreated muscle. The periosteum was sacrificed and the surgical wound was subsequently closed using 3–0 Vicryl sutures in layers. A postoperative analgesic (meloxicam, an NSAID) was given subcutaneously (0.2 mg/kg) along with a prophylactic antibiotic cover using an oxytetracycline solution (10%, by injection at 0.2 mL/kg). After full recovery, the rats were transferred to a normal holding cage and 10 mL saline was given S/C to avoid dehydration. The activities of the rats were monitored on a daily basis, as was the site of the operation for any bleeding or signs of infection. Animals were euthanized eight weeks after craniotomy using an overdose of sodium pentobarbital (140 mg/kg injected subcutaneously). The cranial defect sites were harvested, along with the surrounding bones and soft tissues. The harvested samples were fixed in 10% formalin for subsequent histology assessments. Samples were transferred to plastic containers, containing 10% buffered formalin (w/v). The cuts divided the regenerated tissue and its surrounding native bone into upper, middle, and lower sections. Specimens were removed from the 10% buffered formalin and loaded into cassettes of a suitable size and placed in a rotor basket in buffered 10% formic acid for the process of decalcification to take place. Fluoroscopy was used to check the end point of the decalcification process to avoid excessive damage to the tissue. The decalcified tissue blocks were embedded in paraffin wax and 5 m sections were prepared. The sections were then stained with Hematoxylin and Eosin (H and E), and mounted on histological glass slides prior to assessment. The slides were then examined under light microscopy (Zeiss, Germany). Representative areas were captured using different objectives 5×, 10×, 20×, 40× using an Axio-Vision Camera, and images were saved as TIFF files. Bone regeneration, quality and graft incorporation were recorded using a semi-quantitative scale as described previously. Histomorphometery was carried out using ImageJ 1.50i (Wayne Rasband, USA). A binary image of the surgical defect and the regenerated bone was obtained, and the numbers of pixels were counted. The calculated surface area of bone was performed using the same software as previously reported. A clinical examination in each of the different study groups (four groups of ten rats each) was undertaken. In general, white membrane like fibrous tissues was observed to cover the defect area. No remnant of the injected cement or of muscular tissue was detected. For experimental group no. 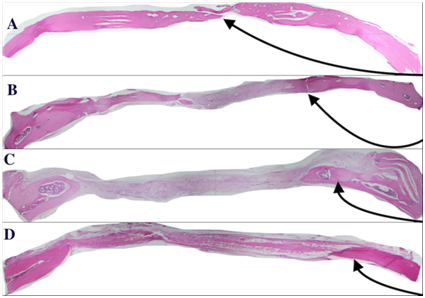 1, three rats showed full bone regeneration that bridged the gap (Figure 2). The remaining seven rats showed partial bone regeneration from the edge towards the centre. Thus, a bony union was achieved in all rats from experimental group no. 1. In contrast, none of the other experimental groups showed complete clinical bone regeneration. In experimental group no. 2, only partial bone regeneration was detected, the remainder of the defect was occupied with white membrane, fibrous like tissue. In experimental group no. 3, there was little change in the size of the defect it was mainly occupied with white, fibrous like tissue. Irregular bony border of the defect was detected, which could be due to bone regeneration or active remodelling at the border of the defect. In control group no. 4 where only the muscle graft was applied to the calvarial defect, no bone union was achieved, and the muscular tissue was completely transformed into a white fibrous tissue. Figure 2: Show the size of the created calvarium defect(A), and the harvested calvarium’s rat after 2 months from day of surgery(B), area of bone regeneration bridging the gap (B). Examination of decalcified sections confirmed that the magnitude of bone regeneration in the defect varied across sections in the different experimental groups. In experimental group no. 1, some of the sections showed the presence of complete bone, bridging the gap (Figure 3). The area of bone regeneration was observed in the centre, and at the borders of the defect. The regenerated bone showed active remodelling, with the presence of both lamellar and woven bone, and the presence of multiple reversal lines (Figure 3). Numerous bone marrow cavities, mature osteons and marrow caves were noted. The connective tissue that replaced the muscle graft was highly cellular with a cell population that consisted of osteoblasts, pre-osteoblasts; remnants of myoblasts were also noted. The area toward the centre of the defect showed less organized woven bone, which was located next to the loose connective tissue. In experimental group no. 3, a highly remodelled border was seen in the defect, which caused expansion and displacement of both cortices. The scoring system used, revealed that in 30 of the 40 cases there was some evidence for the development of at least one cortex even though there were no bony bridging. In all cases, there was no evidence for the presence of residual bone cement. The score was also high for vascular spaces, with most of the examined slides showing more than 20% of marrow spaces were occupied with mar-row cells. This finding indicates that the tissue was highly vascularized at the time of bone regeneration. A remnant of muscle/loose connective tissue that contained fibroblasts, osteoblasts, or pre-osteoblast but lacked inflammatory cells, was also detected. Finally, even in the control group where no bone regeneration had occurred, the trans- formed muscular tissue was found to be highly cellular, containing narrow-like cells, having an abundance of collagen fibers. Figure 3: Photomicrograph of histological sections through the bony defects at 2 month after surgery. (A) showing the bony defect in experimental group 1, arrow shows the central area of the defect with is composed of osteoid and highly vascular periosteum-like connective tissue. (B) Group 2 showing the area of bony union (denoted by arrow) with only two-thirds of the defect filled with bone. (C) Group 3, showing that the area of active bone remodelling has ceased but does not fill the defect. (D) Shows a section for group 4, which is filled with untreated muscle, the bone border (denoted with black arrow) shows mature lamellar bone. The percentage area of regenerated bone inside the surgical defect in all experimental groups was calculated. As expected, greater bone regeneration was seen in experimental group no. 1, ranging from 75.3% to 36.9%, with a calculated median of 64.2% (Table 1). This animal study provides strong evidence for role of BMSCs in the regeneration of critical size bone defect by using a free muscle flap as a rich source of a blood supply. In one case, we observed 75% calculated area of bone regeneration from an animal in the experimental group no. 1 where the muscle flap had been injected with BC, BMP-7, and BMSCs. Previous work has shown the utility of a muscle pedicle for bone regeneration of critical size defects created in rabbits and goats. However, the previous study was performed as single cohort study, and as a result the proposed theory relating to bone regeneration could not be confirmed. The data obtained in this study confirms that the presence of a biological scaffold, like muscle, is crucial for bone regeneration, since it provides a means for vascularization, even in control group no. 4, which used untreated muscle grafts. More importantly, the presence of a cytokine like BMP-7, combined with BC, in the experimental group no. 2 was inducing bone regeneration in about one third of the calvarium defect. Similarly, Liu et al., 2014 reported bone generation in a genetically engineered muscle graft to obtain sustain release of BMP-2. On the same track, another study has reported bone regeneration that bridged a critical surgical defect, using pedicle sternomastoid muscle flap that was used to circumvent a BMP7 and collagen carrier in mandibular defect in goats. It would have been ideal in the current study to add fifth study group, which would be treated with BC, and MSCs to emphasis on the role of BMP in bone regeneration, this may add to the fund of knowledge about the role of BMP in bone regeneration. However, our previous experience using biodegradable calcium phosphate scaffold and MSCs to regenerate critical size mandibular defect in rabbit showed no statistical significant difference when compared with degradable beta-calcium phosphate (-TCP). The authors have concluded that the addition of MSCs to the biodegradable -TCP scaffold did not improve reconstruction of the created mandibular defect. However, seeding more differentiated cells like- osteoblast/-TCP compound had the better effects on guiding bone regeneration rabbit radial defects. With regard to the experimental group that was treated with BC alone, the median percentage of bone regeneration that occurred at the border of the defect was around 12.25% (range of 10.2–14.3). The role of bone cement in the regeneration of bone defects has been studied previously, and several theories have been proposed. First, the surface microstructure of the injected cement may pro- mote both the precipitation of biological apatite and cell adhesion molecules onto the surface of the material. The micro-porosity being less than 5 m in diameter that might enhance ionic exchange with body fluids. Furthermore, the micro-pores greatly enlarge the surface area of the material and this may facilitate the adsorption and entrapment of endogenous proteins including bone morphogenic proteins. A second theory is the inflammation theory, as proposed by Laquerriere et al.. They have suggested that, an inflammatory reaction provoked by bone cement micro particles and thus inflammatory cytokines (tumor necrosis factor-alpha, interleukins-6, 10, -8) would be release locally which stimulated circulating stem cells to differentiate into osteoblastic cells for bone regeneration. Based on our data, it is reasonable to imagine that presence of the cement microstructure acts as vehicle for the added protein (i.e., exogenous BMP-7) and thus promotes both adhesion and differentiation of the injected progenitor cells into osteoblasts. On the other hand, the free muscle flap, which contains highly active progenitor cells and vascular channels, could also act as a kind of ‘bio-reactor’ for the injected BMSCs. Decalcified histological section assessment confirmed the clinical examination, which showed bone regeneration bridging the gap in some samples in experimental group no. 1. Very thin bone, or an island of bone, was detected at the centre of the defect in histology sections. The bone detected was at different stages of maturation, the more mature bone with a lamellar structure was observed at the periphery and an area of woven bone was seen towards the centre. Moreover, less mature osteoid bone was detected at the center of the defect, which was located next to the periosteum-like loose connective tissue. This pattern of bone maturity indicates that the dynamics of bone regeneration, which could be from the borders toward the center of the defect through the muscle, free graft. This pattern of bone regeneration has been studied previously using dynamic histomorphometry. Undecalcified histological section examination would have complemented the histological assessment for our samples. With regard to the fate of the muscle graft, complete muscle transformation was noted, with the tissue becoming a loose connective tissue full of osteoblast, preosteoblasts with a small number of myocytes. This may indicate there were possible metablastic changes occurring to transform the muscle cells into bone forming cells. On the other hand, the samples which were grafted with the un-treated muscle graft, was retain its vascularization and look like connective tissue, that rich with colonies of cells resembling resemble bone marrow cells, with no evidence of tissue necrosis or the presence of inflammatory cells. One could infer that the muscle was essentially acting as bioreactor for endogenous cells and exogenous rBMSCs as well as it acts as rich source of blood supply. In summary, the concept of converting muscle into bone has been suggested previously. In this first controlled experiment using skeletal muscle as a bioreactor, the group that received bone cement and BMP-7 and were seeded with mesenchymal stromal cells had a large amount of bone regeneration that bridged the critical size bony defect in the rat ‘calvarias.’ Here, BMSCs were proven to augment the process of bone regeneration inside muscle graft. This technique is very promising in the world of tissue engineering due to availability of muscle tissue. However, further refinement would be required before it would reach clinical applications, like optimization of quantity of the injected BMP, MSCs count and the best bone cement that would give the optimum results. 1. Torroni, A. Engineered bone grafts and bone flaps for maxillofacial defects: State of the art. (2009) J Oral Maxillofac Surg 67(5): 1121-1127. 2. Alfotawi, R.A., Ayoub, A.F., Tanner, E.K., et al. A novel surgical approach for the reconstruction of critical-size mandibular defects using calcium sul- phate/hydroxyapatite cement, BMP-7 and Mesenchymal stem cells- Histological assessment. (2016) J Biomater Tiss Eng 5(1). 3. Evans, C.H., Liu, F.J., Glatt, V., et al. Use of genetically modified muscle and fat grafts to repair defects in bone and cartilage. (2009) Eur Cell Mater 18: 96-111. 4. Ayoub, A., Challa, S.R., Abu-Serriah, M., et al. Use of a composite pedicled muscle flap and rhBMP-7 for mandibular reconstruction. (2007) Int J Oral Maxillofac Surg 36(12): 1183. 5. Liu, F., Porter, R.M., Wells, J., et al. Evaluation of BMP-2 gene-activated muscle grafts for cranial defect repair. (2012) J Orthop Res 30(7): 1095. 6. Hassel, S., Schmitt, S., Hartung, A., et al. Initiation of Smad-dependent and Smad-independent signaling via distinct BMP- receptor complexes. (2003) J Bone Joint Surg Am 85: 44. 8. Al-Fotawei, R., Ayoub, A.F. Biomaterials for oral and cran- iomaxillofacial application. (2015) Frontiers of Oral Biology edited by S. Deb, Karger Publisher, London, 17: 978-3- 318-02461-6. 9. Alfotawei, R., Naudi, K.B., Lappin, D., et al. The use of tri-calcium phosphate (TCP) and stem cells for the regeneration of osteoperiosteal critical-size mandibular bony defects, an in vitro and preclinical study. (2013) J Craniomaxillofac Surg 42(6): 863-869. 10. Xian, Z., Lihong, X., Zhen, Y., et al. Allogeneic osteoblasts combined with ß-tricalcium phosphate to repair of bone defect. (2016) J Biomater Tissue Eng 6(4): 270-276. 11. Le Nihouannen, D., Daculsi, G., Saffarzadeh, A., et al. Ectopic bone formation by microporous calcium phosphate ceramic particles in sheep muscles. (2005) Bone 36(6): 1086-1093. 12. Daculsi, G., LeGeros, R.Z., Heughebaert, M., et al. Formation of carbonate-apatite crystals after implantation of calcium phosphate ceramics. (1990) Calcif Tissue Int 46(1): 20-27. 13. De Groot, J. Carriers that concentrate native bone morphogenetic protein in vivo. (1998) Tissue Eng 4(4): 337-341. 14. Laquerriere, P., Grandjean-Laquerriere, A., Jallot E., et al. Balossier, P. Frayssinet, and M. Guenounou, Importance of hydroxyapatite par- ticles characteristics on cytokines production by human monocytes in vitro. Biomaterials (2003) 24(16): 2739-2747.